While my reasons include [INSERT REASONS], I would expect my request to be honored without a stated reason. 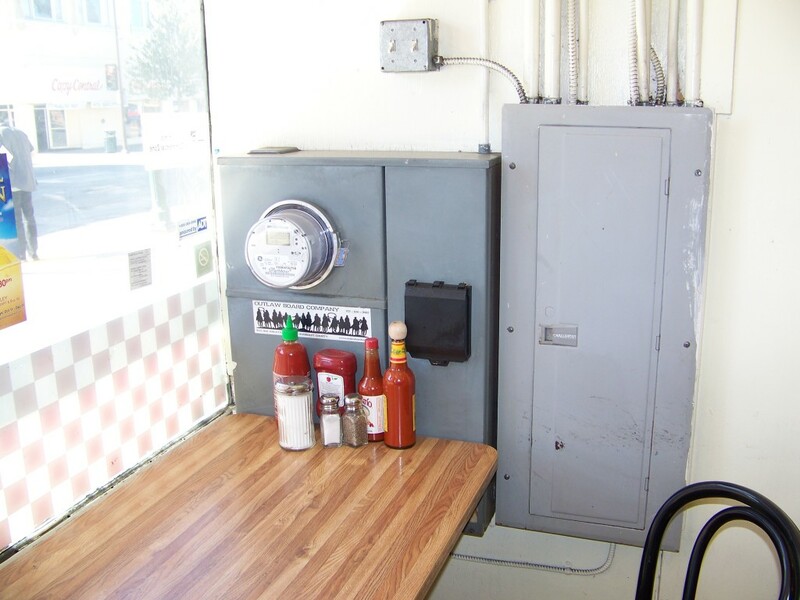 If you refuse our request and place a smart meter at our business, we will have no choice but to promptly remove the meter ourselves and restore the analog meter. Thank you for respecting our request. Decision 12-02-014, released February 9, 2012, Conclusion of Law #1. Note from admin: Send this letter by certified mail. 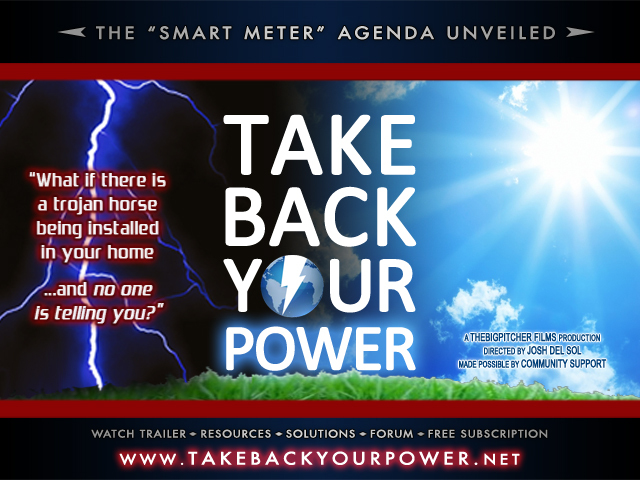 Posted on April 20, 2012 March 11, 2014 Author adminCategories smart meters, Take Action! The only problem is, SmartMeters do not transmit on microwave frequencies, they transmit in the 900 Megahertz band on UHF (Ultra High Frequency) . The Utility Corporations all know this, so if one sends such a letter, it will be chucked into the circular file (trash can), just so you know ! “Although there is no formal definition of the frequency range for “microwaves”, some text books will define all frequencies above 300 MHz as microwaves.” I have asked another RF engineer about using the term microwave and they found it acceptable for 900 MHz. I feel certain they will not dismiss the letter based on the useage of the term “microwave”. 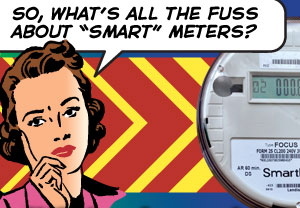 You are correct, the SmartMeters do have 2 transmitters, but the ZigBee 2415 MHz transmitters are not being used now. Those ZigBee radio transmitters are to send one way pulses to the planned “smart” thermostats supposedly to be available for customers to volunteer for in the future. Customers can now purchase their own smart thermostats, but the program has not been started in PG&E territory. Every electrical and broadcast engineer that I have talked to says the the term microwave is arbitrary, but anything under 1000MHz is never considered microwave in the professional world. These ZigBee transmitters could be considered microwave, but they are extremely low powered, only around 20 mw, and they would only be transmitting (if and when the smart thermostat program ever gets started) on certain hot days during certain hours in certain areas to send a pulse every half an hour or so to send a signal to the smart thermostat to cycle the compressor motor on and off. Nothing else will ever be controlled, no fans, heat, lights or any other device in the building. It is the customer purchased building automation and energy management systems that have been available for decades that control devices, lighting and heating systems. These ZigBee transmitters are not being used now, so it is quite accurate to say that the SmartMeters are not transmitting microwave now, and if and when they do in the future, it will only be on a select group of customers who volunteer for the smart thermostat program. Most residential customers in the S.F. 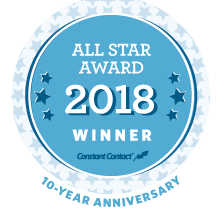 bay area and on the coast do not have air conditioners, and commercial customers have been controlling their HVAC systems for decades with their own energy management systems, so they will not be using the utility and are exempt from such external controls. Personally, I seriously doubt that many people will sign up for the program, the smart thermostat program is just another greenwash program being marketed by the utilities so they can get federal tax money to say that they are “enabling” customers to save energy. The World Book Dictionary (1987) definition of microwave: n. a high -frequency electromagnetic wave, usually having a wave length from one millimeter to thirty centimeters: The biological effects of microwaves include structural or functional changes to the…central nervous system, all due to the heating caused by microwave absorption (New Scientist). Could you please explain what radio frequencies use waves that are one millimeter to 30 centimeters. Microwave radio was invented by the US military during world war II. It is a very high powered and high frequency radio used for radar and communications. Many land based telephone systems use microwave repeaters for transmitting voice and data over long stretches where there are no land lines, these are like trunk lines that carry trunked signals. I’m sure that you have seen those giant microwave feedhorns in rural areas and at mobile phone towers and other communication sites. Microwave is line of site very high powered communications, and it is not used by the general public. There are also passive microwave repeaters on mountain tops that repeat the high powered signals. If a person put their face in a microwave feedhorn, they would get severely damaged or die. To me , it seems like these low powered ZigBee and WI-FI radio systems are high frequency radio, but nothing at all to what most engineers call microwave. But it sounds scary, and that is the desired effect. An electromagnetic wave with a frequency in the range of 100 megahertz to 30 gigahertz (lower than infrared but higher than other radio waves). Microwaves are used in radar, radio transmission, cooking, and other applications. I am not a technical expert, but like I wrote earlier, I have been told it was fair to use the term microwave, and now I have provided several references to dictionary definitions. Maybe a technical person could help to answer your question. I guess it would be fair to call the radio communications that are extremely high powered microwave, but I don’t really think that the very low powered ZigBee and WI-FI are microwave. Microwave is a radio frequency, but it was invented for high powered uses, like cooking things, sending radar to detect objects far away, and sending communications signals that are so high powered, that the passive repeaters can repeat the powerful signals without the need of amplification, like on remote mountain tops where there is no power available for amplification. Try and do that with a mobile phone or SmartMeter signal, it is not possible, so, when the definition says “lower than infrared, but higher than other radio waves”, I would deduce that microwave is in a class of its own. Not something that is often confused with regular radio communications. Like my friend who is a retired broadcast engineer told me, the term microwave is arbitrary and is purpose based, but professionals don’t consider anything under 1000 MHz microwave. Why, probably because most microwave systems don’t use anything lower than that. Perhaps you could consult with someone more technical than a broadcast engineer to find out what microwave systems operate on any frequency lower than 1000 MHz. Anyway, I enjoyed the debate, thank you admin, and keep on learning more. I learn something new almost every day. Redi- you write that microwaves are associated with high powered use- and that smart meters are low powered- but upon reflection, yes, one meter may be “low” powered, in comparison to cell antenna, which can be 1000+ W. However, smart meters aren’t on just one home- they are placed, or attempted to be placed on every home, and business. Collectively, and including the 1/4-3/4 W from gas meters that’s 2.75-3.25 W per house- distributed throughout a city- multiplied by thousands of homes and businesses, constantly transmitting millions of pulses per day. Collectively high power. We need to look at the smart meter not in isolation, because they would not work alone- they require other smart meters, plus infrastructure to support their microwave radio system. I too appreciate the opportunity to discuss, and clarify the use of the term, microwaves. Will anyone else care to weigh in on this topic? A friend of mine just sent me something on the internet, which is a page of little known facts, one of them was that microwave was invented when a radar technician walked close to a radar tube with a chocolate bar in his pocket, and it melted. If you look at the radio spectrum frequency allocation chart, there is no band called microwave in the chart. Microwave is more like a special kind of radio frequency used for special applications, not necessarily a band of the spectrum between certain frequencies. That is, there are other radio systems that operate in the same bands as microwave, but are not microwave. Have you ever looked inside a microwave oven ? Have you ever seen a radar antenna or a microwave communications feed horn ? These microwave devices are very high powered and use large antennae, nothing at all like a built in antenna in a smart meter or smart phone. Originally, there was VLF, long wave, medium wave (standard broadcast AM), and short wave (VHF and UHF). 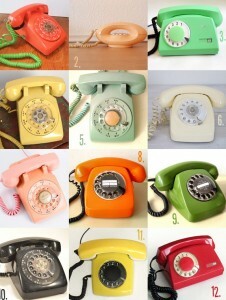 Now, they use frequencies much higher for all kinds of exotic things, like satellite and aerospace communications. I just fired up my old computer looking for the link to the government radio frequencies, but I cant’t find it. But if you are interested in the radio spectrum, do an internet search of: radio frequency allocations.us.gov. I too, would like to see some other professionals chime in to this discussion, and all the other ones too. But so far, nobody seems very interested. I just realized a way to explain the power to produce microwaves verses the power to produce the radio transmissions from smart phones and smart meters in layman’s terms. The only device in a home that produces microwaves is the microwave oven. Even a basic microwave oven draws 13.2 amps of electrical current (I know this because I run the power feeds to the ovens) to produce microwaves. In contrast, the radio transmitters in smart meters and smart phones draw such a small amount of current, it is measured in milliamps. And one can imagine the power required to power microwave feed horns and radar systems, it’s huge. No, you wont’t find that information about the corporate/government microwave communications and radar gear on the internet. The government does not want the public to know how much power the taxpayers spend to power top secret, proprietary microwave systems. There is no way that anyone will ever stop the military industrial complex. Radiofrequency (RF) and microwave (MW) radiation are electromagnetic radiation in the frequency ranges 3 kilohertz (kHz) – 300 Megahertz (MHz), and 300 MHz – 300 gigahertz (GHz), respectively. Research continues on possible biological effects of exposure to RF/MW radiation from radios, cellular phones, the processing and cooking of foods, heat sealers, vinyl welders, high frequency welders, induction heaters, flow solder machines, communications transmitters, radar transmitters, ion implant equipment, microwave drying equipment, sputtering equipment and glue curing. ” I feel very comfortable using the term “microwave radiation” in describing the smart meter transmissions. So, radio frequency radiation (RF) and microwave (MW) share the same frequency range, but they are different forms of radio waves. I do wonder what special microwave devices operate in the low bands of the radio spectrum ? Must be very special applications, probably proprietary medical or other commercial uses that nobody would ever know about except the developers and investors of these highly specialized products. I know that for communications purposes, microwave uses much higher frequencies than smart meters or mobile phones. And consider this, microwave communications are very high powered, focused, line of site communications capable of handling many multiplexed channels trunked in to one tight beam. Microwave communications transmitters do not use omni directional antennae like smart meters and mobile phones that send the signal out in all directions, they use giant feedhorns that send the signals in a very compact beam to the receiving dish. And if you get in line of powerful microwave communications transmissions near the source, it will fry you or possibly even kill you. According to you Sharon, you think that you can call any radio microwave, but that doesn’t mean that what you say is factual, it is just your theory that you feel comfortable with to suit your own agenda. It is a 20MHz spread in the 700 MHz UHF band known as the D-Block. Another new radio system to serve the NSA, DHS, FEMA and a host of other government agencies and local first responders. That will mean that there will be even more RF added to our communities, more antennae on public safety buildings and repeaters throughout the country. And, microwave communications may also be a part of it, I don’t know for sure. But it should concern the readers on this site to keep informed about what is happening in the country with the radio spectrum allocations. Check it out. How is it that the public has not cried out in pain before this time in response to all the other bandwidth being utilized for the multitude of purposes? 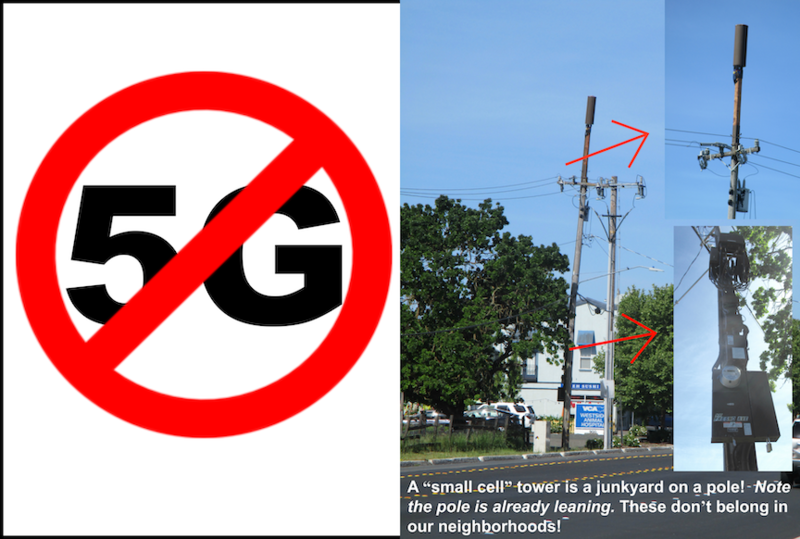 Is it simply because these low-power transmitters are now being connected to our homes? Thank you Richard for that link. That is the same one that I had on my old computer. A note to viewers of this page, you need to utilize the zoom tool, otherwise it is very hard to read. And also, you need to scroll back and forth and up and down when zoomed in. It is fascinating to see what the government/corporations have been doing with “the air” waves for over one hundred years. The FCC changed all the TV broadcast channels to digital operating at much higher frequencies, thus freeing up some of the 500 to 900MHZ spectrum to be sold to the highest bidder. I would not be surprised at all if the corporate creation of radio electric automated meters (SmartMeters) had a part in this. After all, it is just free air that the FCC sells to the corporations, I want my cut of the action too, gimme some doughsky FCC for selling my air. Very interesting, I finally decided to do an internet search of microwave transmission. I have been posting about microwave for many years, but that information that I posted was from my own professional knowledge and working with engineers. But I urge all of you who claim that smart meters and mobile phones use microwave to look microwave transmission up in Wikipedia, which is what I just did. It confirmed everything that I have posted. Microwave communications are very small waves, different that regular radio waves. Microwave communications start at 1Ghz (1000 MHz like I posted) and go up to 30 GHz. Microwave is point to point communications capable of carrying multiple of channels on one beam. I was correct all along, smart meters and mobile phones are NOT microwave communications. And anyone who keeps spouting that out is spewing false information and propaganda which is a discredit to our fight against the SmartMeters. You people need to focus on the facts, and there are many true facts that SmartMeters are a very bad program being forced upon citizens against some of our wills. SmartMeters are a corporate ripoff, and these utility corporations bribe the government to promote their corporate agenda with these meters which are dangerous, toxic, expensive and no return on our investment, sometimes inaccurate, and use RF to automate meter reading to eliminate good union jobs. That should be more than enough ammunition to oppose the program. RK – Not sure of why the definitions in Wikipedia vary for “microwave” versus “microwave transmission” (the microwave page has an interesting lead in on the limits within RF engineering), but either way mobile phones utilizing 1800-1900 MHz (as many do) would be considered a microwave transmission, would they not? 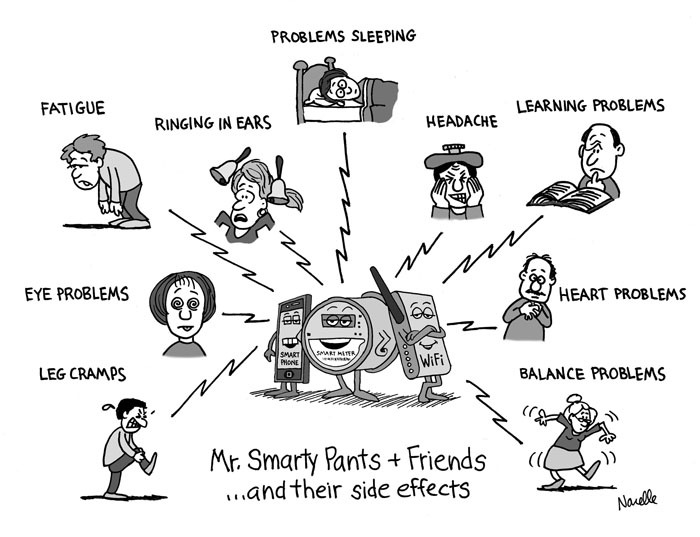 Also, could you clarify your position on SmartMeters being “dangerous” and “toxic”? Just curious. Thanks. I know that some of the mobile phone networks do utilize 1800-1900 MHz, but that is not microwave communications that they are using. Microwave communications are used for line of sight, point to point trunking of data and voice signals. They need special, large feedhorns and dishes to utilize microwave transmissions. All mobile phones use antennae that are now usually built into the device, these antennae must be able to send the signal out in all direction to hit the mobile phone towers (that are fixed locations). Just because a radio device operates at 1800-1900 MHz does not automatically make it microwave. That is not to say that microwave is not used in mobile phone systems, microwave is used for fixed transmitters on some mobile phone towers to multiplex all the mobile users and then repeat it to other towers ( no more than line of sight or about 40 miles), then those signals are de-multiplexed and sent out to the various individual mobile data and voice phones and devices. 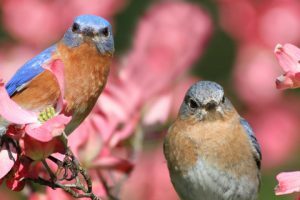 I say that they are dangerous because the SmartMeters have electronic components that are connected unfused to line voltage. The unprotected lines from the power grid have unlimited electrical potential, and I believe it is very true, that the SmartMeters have been responsible for starting fires and damaging property. I say that SmartMeters are toxic because of some of the materials used in the fabrication are harmful during the manufacturing process and when burnt at the point of installation, and also the additional RF radiation being added to the environment can affect peoples health. Isn’t that like saying I didn’t use sunlight to burn a hole in the paper; when I actually did, I just focused the beam, concentrated the energy, and sent it in a specific direction? It’s still sunlight; and likewise, with mobile phones, it’s still microwave. Is this not true? Microwave communications are different than all other radio communications, so yes, the answer to your last sentence is yes, it is not true that mobile phones use microwave. Did you know that some radio communications for the aerospace programs use lazer ? And did you know that some radio waves are sent on electrical power lines using a power line carrier ? There are many different applications that utilize radio frequency for communications, but only one of them uses microwaves, and that is microwave communications. If a radio communication uses a frequency of 1800 MHz, which is well within the “microwave” portion of the electromagnetic spectrum, then how can you say it’s not a microwave transmission/communication? Are you saying it has to be focused and directed to be microwave? Sorry, but I just don’t get the logic of your argument and I’m really trying to understand it. I’m sorry you don’t understand logic, but there is nothing that I can do to help you. You just believe what you want to, and post about it too, that is free speech. Cans of worms + can opener + burning holes in paper with sunlight, it’s all microwave radiation commin to attack you. Wha Chew Gonna Do Now ? No, RK…I don’t understand *your* logic in saying that something radiating at 1800 MHz is not microwave radiation. You have not substantiated your claim. I’ve tried to have a constructive dialogue with you; to ask specific questions, but it’s not workin’. Oh well. What about Colorado? This effort on your website is inadequate, if you don’t have pre written letters for every state, at least for the major metropolitan areas. / I’ve written a dozen letters to Xcel Energy in CO, and they refuse to remove my smart meter, telling me they do not offer any opt outs and I have no consumer choice and I have no consumer alternate option. PLEASE HELP. 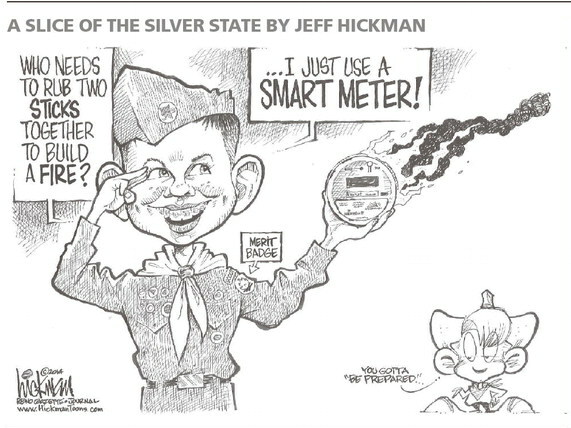 In Colorado your state utility regulators did not make smart meters mandatory. Contact me at emfsafe@sonic.net. yes I can confirm xcel in Colorado will outright refuse to put an analog meter back in. they say they have no opt out and nothing in the works to get one. I am exploring the option of replacing it myself, all of my research is telling me their inevitable threats of disconnection or prosecution are pure bs. honestly I knew it was coming and I never got around to locking up my utility box properly. I amin Denver county and didn’t get it until april 2014.
yes, feel free to modify as needed. Sorry, I meant to ask specifically: Will this letter work the same to block SmartMeter installation from Entergy in Louisiana (rather than PG&E in wherever)? Would the content of the letter require modification beyond substituting the utility name from “PG&E” to “Entergy”? 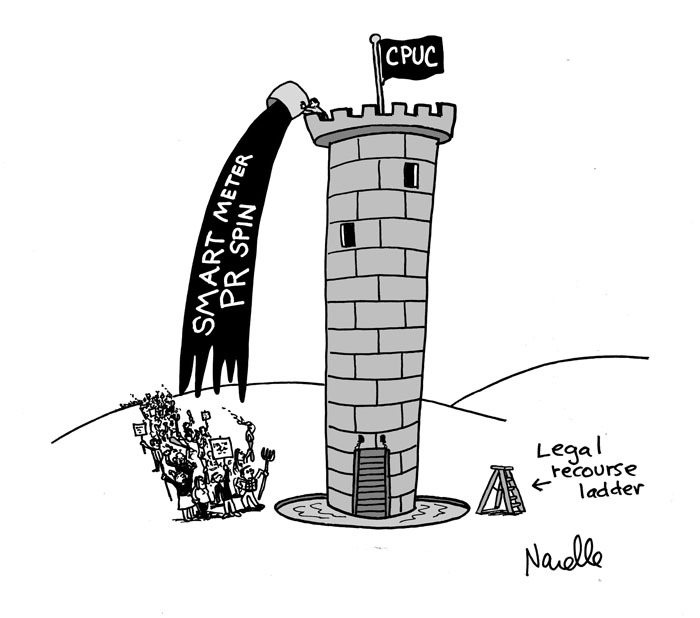 Previous Previous post: SCE and SDG&E- smart meter opt-out approved!